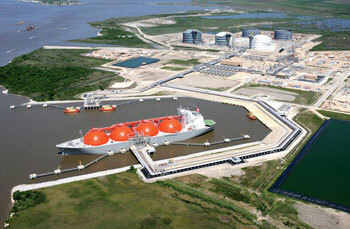 Cheniere Energy's Sabine Pass LNG terminal near Cameron, La. Landmen are once again roaming the hills of the Southern Tier of New York, hoping to entice landowners to sign leases allowing drillers to extract natural gas. One of their mantras is that this fuel will provide domestic energy for US consumers and free us from dependence on foreign oil. What they don’t say is that for the past couple of years these same energy companies have been lobbying the federal government for permits to build LNG export facilities – or modify import facilities so they can export the gas. So, let’s catch up on the news…. On Tuesday Reuters reported that Cheniere Energy is building a $5.6 billion project in Sabine Pass, Louisiana. The project, expected to be ready by 2015, is getting a $1 billion boost from China and Singapore. “New technology,” writes Stephen Aldred, “has opened up supply of natural gas from previously inaccessible shale fields in the U.S., altering the global dynamics of the industry, and turning the country from an importer to a potential exporter.” He notes that Cheniere has already signed long-term commercial contracts to supply gas to India and Korea. This deliberate deception is so frustrating. Using soldiers to sell the American people on the benefits of natural gas is unconscionable. I wish more people could see the BIG LIE. There is no lie or deceit going on here, the United States is producing more natural gas then we currently can use. As the utilization side increases through natural gas vehicle usage, the production will continue to increase. Look at the success story in PA, in less than 3 years PA is growing to be one of the top states in the country in terms of natural gas production. Latest production reports show not even half of the wells are online, meaning much more gas is available as the demand side increases. The deceit is on the part of landmen who use any means possible to get signatures on the leases - including outright fraud (having people forge signatures of spouses, parents, siblings....). Also on the part of industry who espouses domestic energy for use in the US. We don't have too much gas - we're just taking it out faster than we need. And since gas isn't renewable, selling it now means... what? That we'll be forced to import more in the future? Why not advocate for sustainable extraction? Don't tell me that this is a PA success story! These land men have threatened to take peoples gas if they don't sign, Threatened that their water problems won't be addressed if they don't sign. If you call bullying success, then I can only imagine that you are an industry person. I'm living this and it's a nightmare, sold to people by American flag waving LIARS! Don't tell me it's a success when it's broken so many people down to where they are just walking away from the homes they worked their whole life for. This is the worse thing that ever happened to PA!!! frack/fright I couldn't agree with you more...I too am living in the thick of it and it is what I am guessing hell is like. We were also told that if we did not sign a gas lease then if our water well went bad we would not be able to have anything done by the gas industry...they are such liars...we sent them packing and told them where they could shove their gas lease...now we are waiting for our well to go bad and then we are going after the gas industry, no matter how much money it takes. There is NO SUCCESS STORY when this method of extraction is hurting so many people, just to have it shipped overseas. Don't tell me that this is harmless!!! I'm living it!